Un podcast présentant son livre. Standards are the means by which we construct realities. There are established standards for professional accreditation, the environment, consumer products, animal welfare, the acceptable stress for highway bridges, healthcare, education—for almost everything. We are surrounded by a vast array of standards, many of which we take for granted but each of which has been and continues to be the subject of intense negotiation. 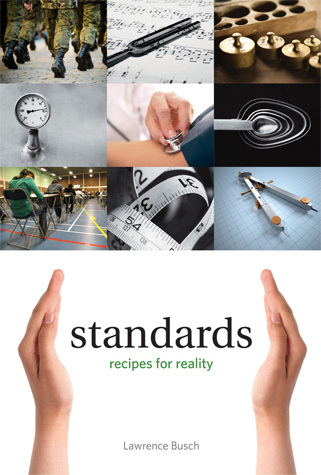 In this book, Lawrence Busch investigates standards as "recipes for reality." Standards, he argues, shape not only the physical world around us but also our social lives and even our selves. Busch shows how standards are intimately connected to power—that they often serve to empower some and disempower others. He outlines the history of formal standards and describes how modern science came to be associated with the moral-technical project of standardization of both people and things. He examines the use of standards to differentiate and how this affects our perceptions ; he discusses the creation of a global system of audits, certifications, and accreditations ; and he considers issues of trust, honesty, and risk. After exploring the troubled coexistence of standards and democracy, Busch suggests guidelines for developing fair, equitable, and effective standards. Taking a uniquely integrated and comprehensive view of the subject, Busch shows how standards for people and things are inextricably linked, how standards are always layered (even if often addressed serially), and how standards are simultaneously technical, social, moral, legal, and ontological devices. Lawrence Busch is University Distinguished Professor in the Center for the Study of Standards in Society in the Department of Sociology at Michigan State University and Professor of Standards and Society in the Centre for Economic and Social Aspects of Genomics at Lancaster University, U.K.